DCCS offers real-time, up-to-the-minute inventory information. Physical inventories have never been faster. With the use of bar code technology, the tedious task of full inventory reconciliation becomes quick, easy and accurate. Reports can identify any missing tickets, find any potential errors, theft of garments and control your cash. An Aged Ticket Report lets you know what orders have not been picked up in 30-60-90 days. You can produce mailing labels, postcards or send email reminders to these customers. Get an accurate picture of the total value of your inventory at any time. Average price per piece, ticket and department listings are also available on a variety of reports. A ‘Matched Tickets’ report provides a listing of all the tickets that were entered into your inventory and should be included in your inventory. A ‘Inventory Entries Not Found’ report provides a listing of all tickets that you entered as part of inventory, but have been removed from the perpetual inventory (examples - picked up or delivered orders inadvertently left in the store). 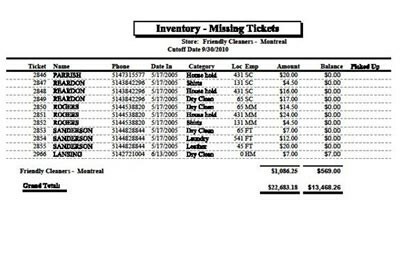 A ‘Missing Tickets’ report provides a listing of all the tickets that were not entered into the inventory, but should be included (examples - stolen tickets, misplaced tickets).